Hello Friends! I hope you are doing well. 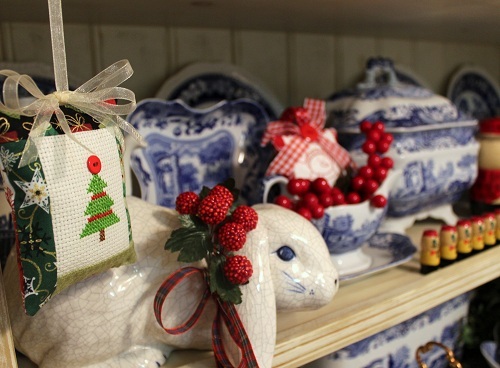 (Christmas) joy of needle and thread is felt by all at the Ivory Spring household. 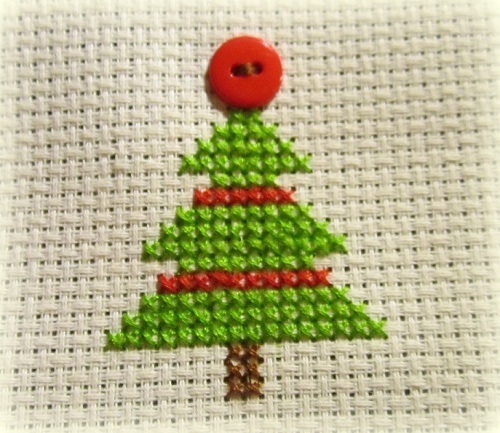 I got my act together (finally), and finished up Miss Baby’s cross-stitched Christmas tree piece into an ornament. Miss Baby stitched 2 threads over 1 on 11-count Aida. 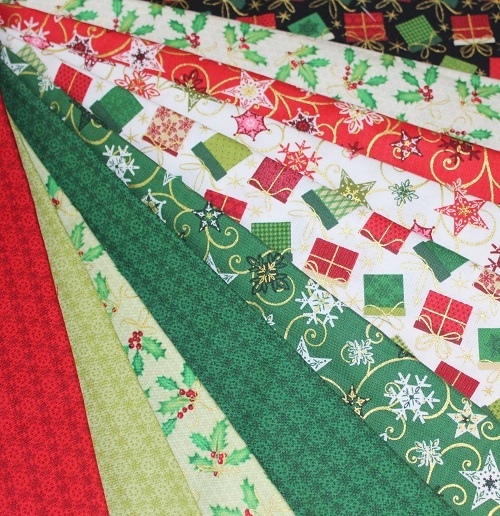 And I used the fabrics from Benartex’s Holiday Magic collection. You may recall I had done a “hen and chick” style pillow ornament ensemble tutorial here, using the same fabrics. The Christmas Tree ornament is a handmade Christmas gift exchange between Miss Baby and my sister. My sister made Miss Baby a doll, and Miss Baby stitched the ornament for my sister in return. 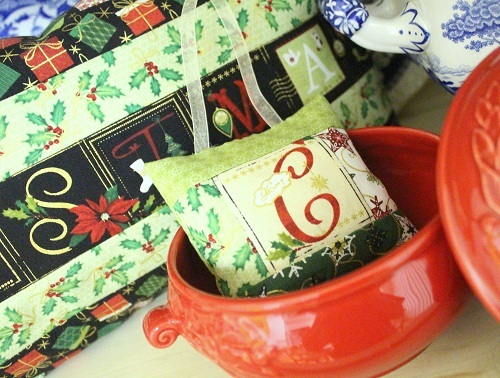 I added a pocket for keepsakes at the back of the ornament pillow. Miss Baby’s note to my sister fits in the pocket nicely. I hope you liked Miss Baby’s ornament. 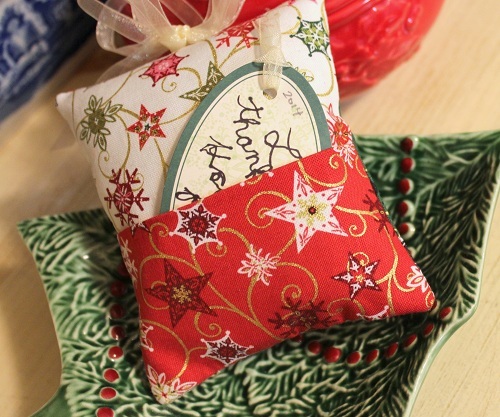 She is stitching another Christmas ornament right now – also a Christmas tree – for herself. But her progress has been a little slower compared to the last one. I am suspecting it’s because she is stitching on 14-count fabric instead of 11-count. My local craft store ran out of their nice 11-count fabric. So I had to settle on the 14-count fabric. Before I say goodbye today, I thought you would like to see Miss Baby’s gumdrop topiary. It was really fun at first, but then it quickly became a training in perseverance. I made Miss Baby finish what she started to complete the topiary. She was very happy she stuck it out when she saw the final result of the topiary, placed beside this snowman teapot I have had for almost twenty years — we were newlyweds, and my husband had to have it when we were out and about after Christmas. Bringing out that snowman each year reminds me of simpler and much younger days… when all we had to worry about was getting through school. Time has changed. :) Thanks for stopping by, Dear Friends! I shall catch up with you again. *** Click here, and here if you missed Miss Baby’s needlework adventures. Click here for the summary of my crafting journey with Miss Baby. 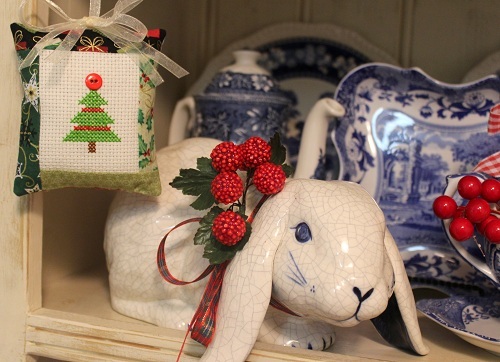 This entry was posted in Christmas, Needlework. Bookmark the permalink. She did such a beautiful job on her tree and you finished it off so nicely for her. Her aunt will love and treasure it. I can see where the gumdrop tree would get a little boring after a bit. She learned a good lesson about finishing what she started. Can I come take lessons from you??? 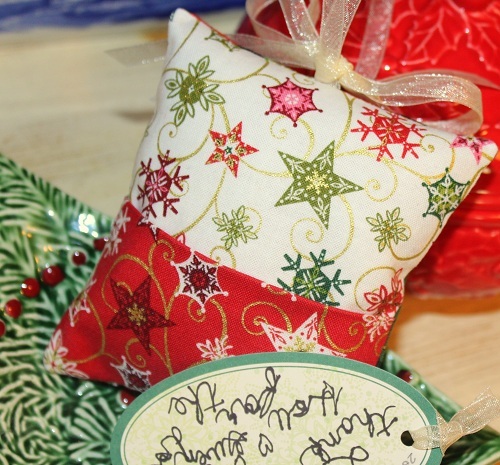 Both Miss Baby’s trees are wonderful – the gumdrop one and the precious little cross-stitched ornament! She seems to have inherited the stitching gene from her mum! She’s way more skilled than I was at her age! What a lovely treasure for your sister. Your holiday decorations really look lovely and how special that Miss Baby has helped to create many of them too! I love her gumdrop topiary. What a great kid friendly project and one that I think she did an excellent job. Inspirational. 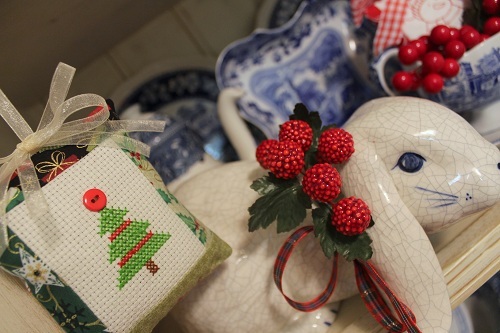 It’a beginning to look a lot like Christmas…….at your house! Love the bunny too! Oh my, I am so impressed with the beautiful projects completed by Miss Baby! The topiary is very clever, perfect for Christmas. The cross stitch is lovely and I know Miss Baby’s Aunt will treasure it. Beautifully done. 11-count cross stitch is impressive, 14-count…….ouch, my eyes are hurting. Even more impressive!!! She has grown into such a neat young lady!!! AND a stitching buddy! Years ago, son #2 (more into the craft thing!!) and I did such a topiary but we both got sidetracked and ate the gumdrops….so a trek to the store had to be done before the finish (we live 35 miles from a store that had such candies!!!). Wonderful memories, though!!!!!!! Hugs………………. Sounds like you have a busy house! Congrats to Miss Baby for finishing, we all understand things get tiresome and we want to move on to the next brilliant and fun idea! Good for you to encourage her to finish! Wow…you really are getting into the Christmas crafting fun with Miss Baby. Love all her great efforts and final products. 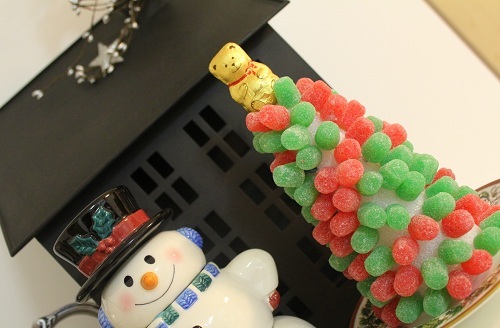 The gumdrop tree is so fun. Have a wonderful weekend. Miss Baby’s ornament and gumdrop tree turned out really cute! It turned out wonderful. The cross stitching is a craft that she will enjoy her entire life. And I love the gumdrop tree. I finally found just red and green ones this year, after hunting for many years with no success, and we are going to make some too.